Some of y'all have been watching too many movies. I hope you put what I call "the eww factor" on hold so you can appreciate the amazing design of a critter that some folks love to hate: the bat. You may want to read this article on bat myths and facts. 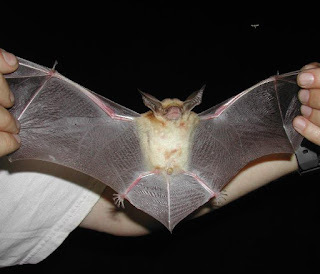 I find bats fascinating, and could make this post unnecessarily long with remarks about how beneficial they are, that some people set out bat houses, and so on. Stories on the evolution of bats strike out. The bat is recalcitrant when it comes to secularists' guesses about its origin. Instead, it is a testimony of creation and intricate design. It's not a mouse with wings, and not a rodent at all. Those wings are very intricately designed, as is the flight system itself. Scientists are studying the vampire bat's saliva, draculin (great word, some scientists show humor) in hopes of helping stroke victims. There is also work being done to make robot bats! This is extremely challenging, since the bat flight system is loaded with specified complexity endowed by the Creator. Researchers have been working on Bat Bot (or B2), a robotic lightweight flier designed to mimic the incredible aerial ability of a bat. Thin silicone wings are stretched over a carbon fiber frame, and a tiny onboard computer, five motors, and sensors allow the robot to fly autonomously. This unique design, copied from God’s creation, allows the Bat Bot to twist, cruise, dive, and maneuver in ways similar to a bat. Bat Bot clocks in at just 3.3 ounces with an 18.5-inch wingspan. It can flap its membranous wings in sync as well as fold each wing and move each leg independently. Eventually researchers hope B2 will be able to hang upside down and perch right side up, just like its live counterpart. It can currently fly a distance of less than 100 feet. However, unlike the real thing, B2 can’t land on its own yet. It still lands on a net to protect its sensitive electronics. Fascinating stuff. You can read the rest and see a short video by clicking on "Bats Inspire High-Tech New Flying Robots".